CD40/CD40L interactions may participate in an inflammatory synapse created between c-Kit+ dendritic cells, malignant T cells, and benign T cells in mycosis fungoides. (A) CD40L is expressed by malignant T cells. A patient with high-burden stage IIA (left 3 panels) and high-burden stage IB (right panel) are shown. (B) CD40L is also expressed by c-Kit+ dendritic cells. A patient with low-burden stage IA (left 3 panels) CTCL is shown; similar results were observed in a total of 3 donors. Costaining of CD40L+ cells with the dendritic cell marker CD11c is shown in the right panel. (C) Both benign and malignant T cells express CD40. The left 2 panels show benign T cells (CD3+Vβ–) expressing CD40. The right 2 panels show malignant T cells (CD3+Vβ+) expressing CD40. Both fields are from the same high-burden stage IIA donor; similar results were observed in a total of 3 donors. (D) An inflammatory synapse is created between dendritic cells, malignant T cells, and benign T cells. Clusters of dendritic cells, benign T cells, and malignant T cells were frequently observed in MF, as illustrated by this costain for OX40L+ dendritic cells, CD3, and the malignant TCR Vβ. A patient with high-burden stage IIB is shown; clusters of these cell types were observed in 5 donors. (E) A proposed model for c-Kit+ dendritic cell, benign T cell, and malignant T cell interactions in MF. 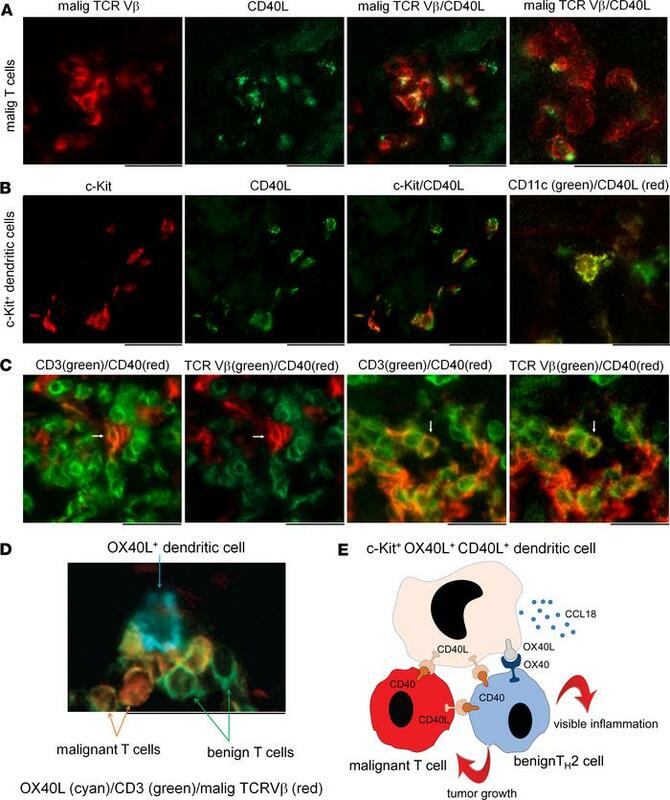 Benign T cells are recruited by c-Kit+ dendritic cell–produced CCL18 and activated by OX40/OX40L and CD40/CD40L interactions leading to visible skin inflammation and protumorogenic signals. Dendritic cells may also directly stimulate malignant T cells via CD40/CD40L interactions. All staining was performed on pretreatment skin biopsies. Results from additional patients are shown in Supplemental Figure 13. A color blind–accessible version of this image is provided in Supplemental Figure 14. Scale bars: 50 μm.